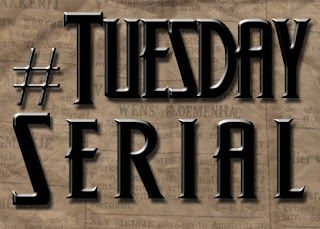 I was part of a Twitter discussion last week with a collective of other writers who are all attempting web serials, and we've decided to make Tuesday our 'serial day'. Previously I'd been updating Tales from Vertigo City on Fridays, which is already #FridayFlash day, and I've often wondered if there's too much of a clash. As of today, I'll be switching to Tuesday. Tony Noland talks about it in much more detail over on his blog, but feel free to check out our efforts using the #TuesdaySerial hashtag on Twitter. In the meantime, catch up on PJ Kaiser's WWI serial, Tony Noland's Just Enough Power, and Jodi Cleghorn's Hartog serial. Or, of course, you can go read part 12 of my own serial, The First Tale. Thank you so much Icy for the plug here. I will ensure to put The First Tale up on my blog roll and tweet it loud and proud. I'll be playing catch up over the next few weeks, but definitely looking forward to exploring a new world and enjoying your writing on a regular basis. It seems such good timing - considering Annie, Paul and I are about to re-launch our old serial The Astonishing Adventures of Captain Juan - and have just invited aboard Chris Chartrand the fourth writer on the serial. Let's see where the wind blows this twitter experiment! I'm very excited about this. I haven't ever written an online serial but I've found it difficult to keep track of others', especially when I expect a stand-alone. This is a great idea. Yeah, I'm really excited about the possibilities this now offers. I personally love reading serials, and I love writing them, so it's nice to have them separated out. It also means my writing schedule is a little easier as I'm not trying to put up two pieces of fiction on the same day. I'm going to try and add a blog roll of serials to my Vertigo City blog - we need to really advertise ourselves! Thanks Icy! I'm glad we were kicking this idea around, as I think this is going to be a great resource for readers and writers of serials. Icy! Thanks so much for your post and for all of your ideas and for *joining us*! :-) We also have a new twitter account as well @tuesdayserial and both Tony and I will be tweeting from there.